Recognised as being one of the most concentrated de-greasing agents available on the market. This viscous liquid is for lifting oil, grease and heavy soiling from the traffic lanes caused in commercial premises such as pubs, clubs and restaurants. 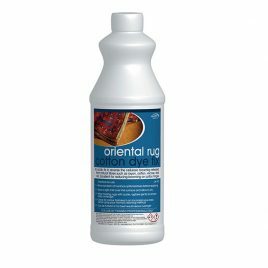 Also a great cleaner in domestic kitchen carpets and other heavy-wear areas. Dilute 1 part product to 20 parts warm water (50ml per litre). 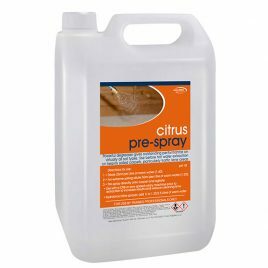 Pre-spray directly on carpet and agitate. Clean area by extraction method. This product may produce a foam in the waste tank, therefore it is advisable to use an anti-foam in your waste tank. A degreasing agent pre-spray to improve the cleaning performance of hot water extraction cleaning on heavily soiled carpets & heavily soiled traffic lane areas. Helps to break down and emulsify grease and tracked soil, food and beverage spills and emulsify grease & dirt until extracted out with hot water extraction cleaning. 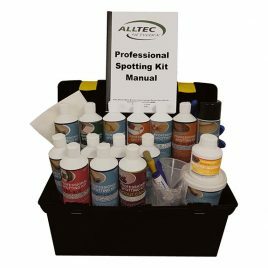 The Spotting Kit is certainly one of the most comprehensive kits available to the professional carpet and upholstery cleaner. Many cleaners have found they can add a lot more money to their business by being a stain removal specialist. 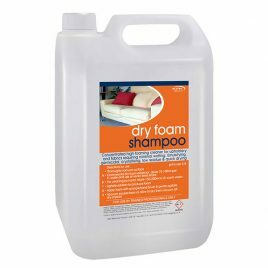 A concentrated, low moisture, dry foam for cleaning carpets and upholstery with minimum of wetting. Contains excellent emulsifiers and germacides. For use with dry foam and rotary machines as well as for the safe hand cleaning of fabrics. High foaming, crystallising, alcohol based and quick drying to leave even less residue behind. Cotton Dye Fix is formulated to fix fugitive dyes on from celloustic fibres on rugs. Cotton Dye Fix is to reverse the celloustic browning released from natural fibres like rayon, cotton, viscous, sisal or (plant based fibres). Excellent at reducing browning from cotton fringes. Pack Size 1Lt. A blend of natural citrus oils and powerful stain digesters designed to safely cut through body grease and grime on those impossible to clean low-pile fabrics such as cotton prints. 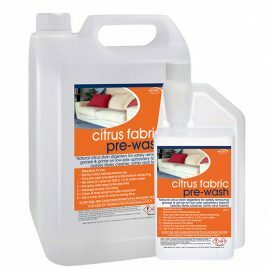 Citrus Fabric Pre-wash will leave the fibres cleaner, softer and smelling citrus fresh and is guaranteed to deliver outstanding results to ensure customer satisfaction every time.